The extraterrestrial impact scenario for the extinctions at the K-T boundary introduced by Alvarez et al. (1980) is the one that is best supported by more than 25 years of research. The evidence for the impact having occurred is overwhelming. It includes the globally distributed, anomalous concentration of iridium at the K-T boundary (Alvarez et al. 1980, Alvarez et al. 1984); shocked quartz and other mineral grains produced at the impact site and deposited at the boundary (Bohor et al. 1984, Bohor et al. 1987b, Izett 1990); and microtek-tite spherules generated by the impact and deposited in the boundary claystone layer (Smit 1999). Furthermore, the impact crater has been found (Hildebrand et al. 1991). Physical effects of the K-T impact event on the Earth are well described by Covey et al. (1994), Toon et al. (1994), Pope et al. (1997), and Smit (1999) and are briefly summarized below. The data presented in Chapters 6 and 7 of this book address what at the outset we termed the "Alvarez challenge,'' to determine whether the fossil record of plants supports the hypothesis that the impact caused the K-T extinction. We conclude that in western North America it does. (2002), who concluded that clastic debris from the impact would tend to spread across North America, the Pacific, and Europe, but that little would reach the Southern Hemisphere. The records of plant extinction at the K-T boundary in Europe are ambiguous (see Section 8.2), but the record from New Zealand (Vajda et al. 2001) strongly suggests that there was at least a transitory effect at that latitude (see Section 9.6). In that part of the world, sulfate aerosols and soot from wildfires may have caused shutdown of photosynthesis. The possibility that global wildfires were set by the impact due to radiation from the fireball and the expanding cloud of rock vapor was proposed by Wolbach et al. (1985, 1990). Ignition of wildfires by ballistic re-entry of ejecta from the impact was proposed by Melosh et al. (1990) and vigorously supported by Robertson et al. (2004). However, direct stratigraphic evidence for these wildfires is equivocal. Wolbach et al. (1985) described graphitic carbon in samples of the K-T boundary claystone from Denmark, Spain, and New Zealand, evidence that was accepted by Melosh et al. (1990). On the other hand, as discussed in Section 7.6, Mclver (1999) saw no evidence of wildfires at or above the K-T boundary in Saskatchewan, and Belcher et al. 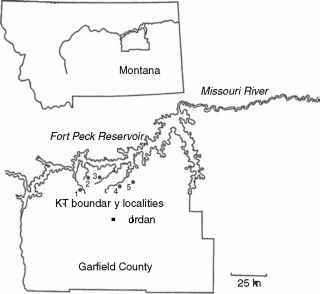 (2003) found no evidence of anomalous charcoal at the boundary at localities they studied in Colorado, Montana, North Dakota, Wyoming, and Saskatchewan. We have not observed unusual concentrations of charcoal, which is derived from charred plant material, in our extensive studies of palynological preparations from numerous K-T boundary localities in North America. While the impact model seems to predict fires, we are impressed by the apparent lack of direct evidence for them in the well-constrained sections of North America. This having been said, the presence of the fern-spore spike suggests that forests were knocked over on a continental scale, raising the possibility that there may have been a major blast effect independent of any major burn. The possibility that the K-T boundary impact event resulted in unprecedented acid rain composed of nitric and/or sulfuric acids has been proposed and discussed widely in the literature. Key references include Prinn and Fegley (1987), Brett (1992), Sigurdsson et al. (1992), D'Hondt et al. (1994), and Pope et al. (1997). There is little or no direct evidence on this subject available from the record of fossil plants. There are other, less-often discussed side effects of the K-T boundary impact that significantly influenced plants. There is good evidence that the extinctions included insects (Labandeira et al. 2002). The loss of insect herbivores must have profoundly affected plant communities of the earliest Paleocene in North America. The possible loss of pollinating insects (Sweet and Jerzykiewicz 1987, Frederiksen et al. 1988, Sweet and Braman 2001) remains speculative, although it is true that, in the early Paleocene, North American floras were dominated by wind-pollinated plants, such as angiosperms that produced Normapolles pollen or, at northern latitudes, taxodiaceous/cupressaceous gymnosperms. It may well be that some plant species survived the extinction event by occupying refugia, isolated locations where relict populations were able to avoid the destructive consequences of the impact. With reference to the K-T boundary, the concept of refugia was introduced by Tschudy and Tschudy (1986) to account for survival of some species that were severely reduced in abundance at the boundary but persisted into the Paleocene. The exact nature of such refugia is unknown, but topography and protection from blast effects of the impact may have been critical. As mentioned in Section 6.2, mires may have provided respite for some species because, in western North America, survivorship appeared to be greatest among plants that had inhabited mires (Johnson 2002). Perhaps refugia played a role in the early Paleocene development of rainforests in Colorado (Johnson and Ellis 2002; Ellis et al. 2003), where diverse species thrived in a location in close proximity to the Rocky Mountain Front at the same time that floras in distal locations remained depauperate well into Paleocene time.